Though I am certainly no expert in fashion, I am predicting the eventual revival of 3/4 sleeves (and forearm waxing), thanks to the coolest wearable computer I’ve ever seen in or out of the movies. Okay, it doesn’t yet exist, not technically, anyway. I still want one. This is the somewhat awkwardly-named Circret (why not circlet?). It has roughly the same profile as your FitBit band, but makes that technology look like one of those rubber band friendship bracelets. 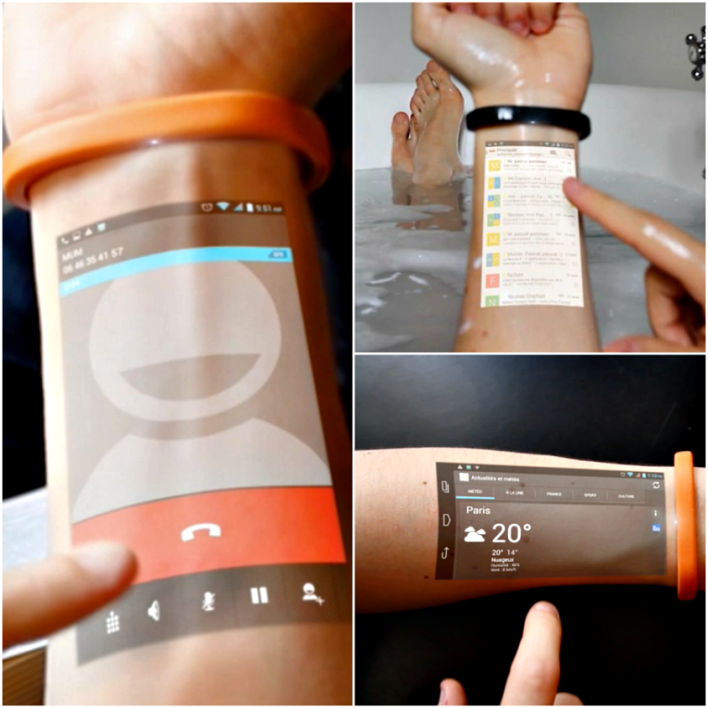 Circret projects a smartphone screen ON YOUR SKIN. The current design has 8 sensors, and the way it works is that the touch of your finger on your arm interrupts one of these sensors. Okay, it wouldn’t work on very detailed webpages or complicated games, but it could certainly do things that smartphones couldn’t handle even a few short years ago, and I’m sure while they raise the money to actually make the thing, the design is only going to get better. These people have redefined the phrase “Shut up, and take my money.” Unfortunately, according to Snopes,* while the technology has been developed, they’re nowhere near actually selling the things yet. The French company who owns the patents is trying to raise millions to start production, so let’s assume we won’t be seeing them for a year or two. *F.Y.I., the Snopes article was last updated in January, but in late February, the company announced the existence of a working prototype. Look out future, here we come! wow. just what people need. another distraction while driving. it is pretty cool tho. but what a cool gadget! I’m sure it’s only a matter of time before actually having external technology will seem as antiquated as CD Walkmans and Betamax video players. We will be our own technology. Part scary, part exciting! I am thrilled with hat this is all happening in our lifetime! seriously. I don’t feel like walking the 3 feet to pick up my phone so let me just twist my wrist and answer that. This reminds me of Russell Crowe cutting his wrist in “A Beautiful Mind” to insert some computer chips. Okay, I made the same joke to beloved. However, it would be nice to never drop another phone in the bathtub!